I had two pieces of fabric I wanted to use this Fall. One was 3 yards of 36″ wide cloque from the now closed Textile Studio and the other was 3 yards of rayon ribbing, both in a mauve-y pink. These are difficult fabrics to work with and dictated the style, the sewing and each detail of what ever I would end up making. The cloque would add width and visual weight to the silhouette so it couldn’t be a dress for me without making me shorter and wider than I already am. It took me a long while to puzzle through how the fabric should be used, years really but I was determined this time because I craved working in this color. But how should I use it???? It is a fairly formal fabric but my lifestyle does not call for formal anything. 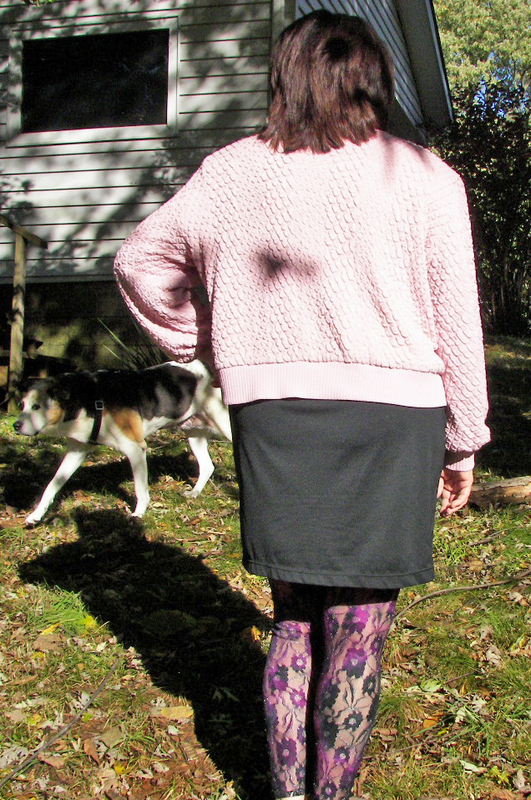 I needed a pattern with simple lines and I needed a pattern that would put all that visual weight on my upper half. 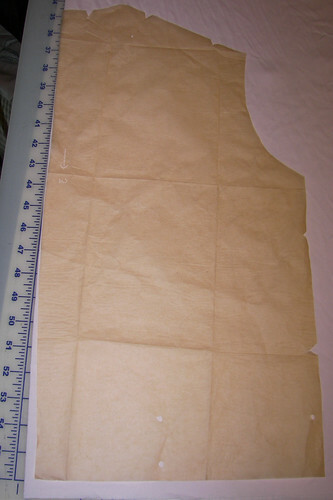 The envelope contained all pieces except the collar. 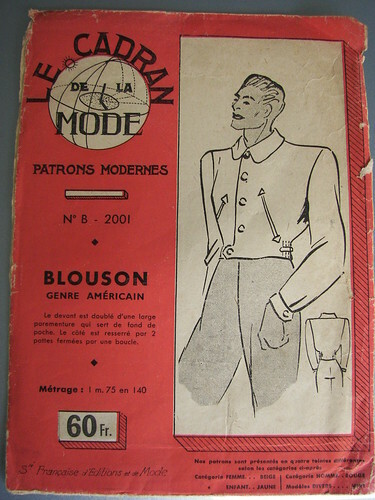 It was drafted for a woven jacketing and had 2 piece sleeves. The boxy shape seemed to be what I needed for this fabric and the pattern’s gathered and tabbed sides gave me the idea to use the ribbing for the lower edge and sleeves. I had to test each design detail and machine stitch as I worked through the design of the jacket. 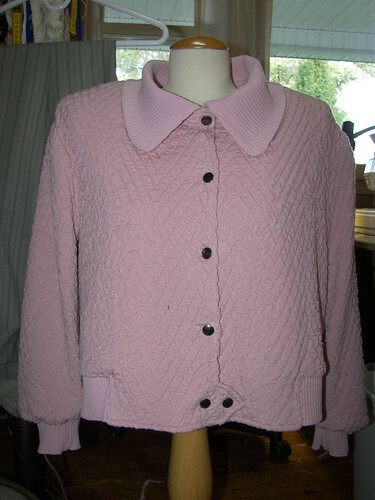 The collar pattern piece (#6) is missing but is not a problem because fabrics I used for this jacket are nylon and rayon knits. A knit ribbing collar can easily create it’s own stand and can fall nicely with little shaping from the cutting. I measured the length of the neckline, folded the intended collar in two and cut the needed length with a little wider flare for the collar tips. In making up the collar from the rayon ribbing I found the tips needed to be rounded so I carefully created the rounded ends. Otherwise the ribbing creates an unattractive “stump” at the pointed ends. As you can see I didn’t use all the cool pointed tabs and double welted pockets for my design. My fabrics were the color I wanted to work with but they were not easy to sew. 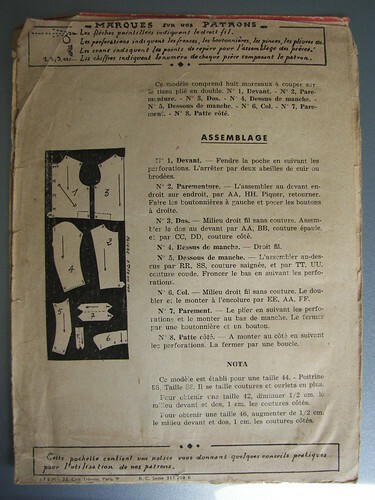 The fabric choice governed the design right down to whether to use snaps or make buttonholes. The snaps won out. I did spend some time basting everything before using a narrow .5 zigzag stitch set at 3 mm in length to join everything together. I also had to decrease the pressure of the presser foot by half to keep from dragging the bubbled surface of the outer fabric into lumps and bumps. 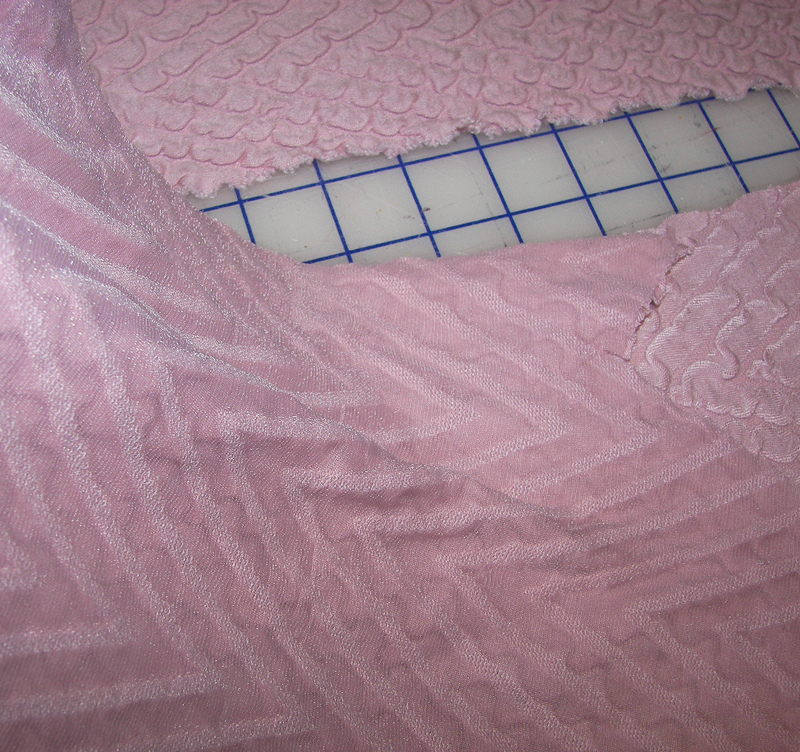 The inside is lined with pink powerdry from Malden Mills (now Polartek, LLC). I used the silky side toward the body for easy on and off of the jacket. I created a back facing to join to the front facing the pattern provided. Both facings are interfaced with fusible Pro-Sheer from Fashion Sewing Supply and I found that pressing the fabric definitely changed it. The pattern pieces had notches and circle and no seam allowances built in and interestingly enough I found that on the long, obviously meant to be straight edges the pattern pieces curved inward. I am speculating when I say that the curve may have been caused by the drag on the pattern paper when the long straight cuts were made. The straight front edges had them too, so I corrected in the layout as I worked. 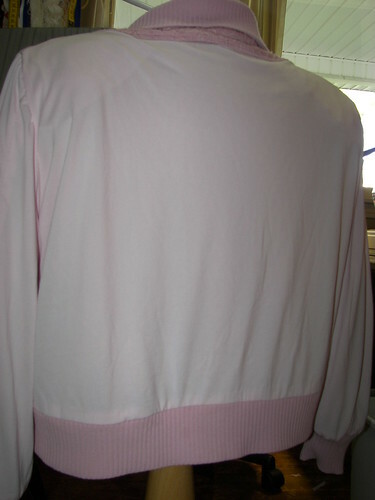 The layout of the sleeves was done so that the straight of the grain ran parallel to the upper sleeve edges. 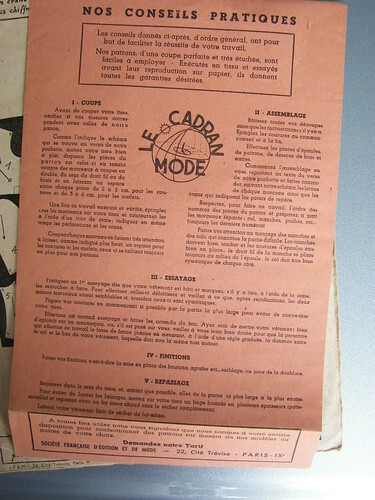 This is shown on the back of the envelope but the markings are not on the pattern pieces. 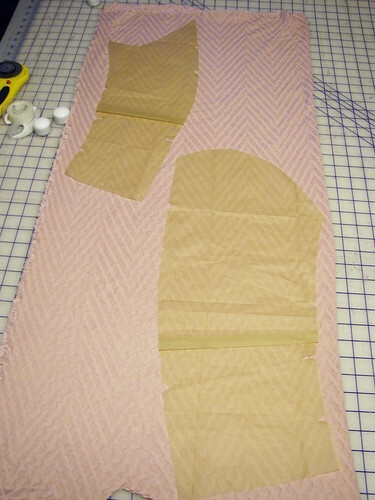 Even though I folded out 1.5″ I also cut off another 1.5″ for the cuffs. 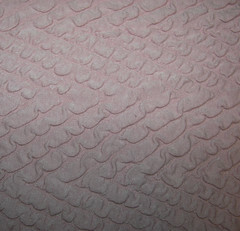 The power dry is cut the exact same size as the knitted cloque but the weight of the cloque caused it to stretch more than the power dry, creating the blouson effect. The skirt shown here is black power dry with an elastic waist and the leggings are made using the method described here. The leggings are made of stretch Chantilly lace from GorgeousFabrics.com turned inside out to tone down the silver threads in the fabric. The Center for Pattern Design held its first annual conference on Saturday. Pattern designers and educators from near and far came to talk about their art, and listen to a great group of people involved in designing and making patterns at the all day conference. Julian Roberts spoke about his methods of subtraction cutting, with great folded paper demos of how it’s done, along with some of dresses made by participants at the previous day’s hands-on workshop. The keynote speaker was Gail Gondek, who has designed patterns for Ralph Rucci and Peter Som, after many years working with Geoffrey Beene. She talked about some of her experiences working with a designer to create their vision in cloth, about the process of taking a design from concept to the runway. Afterwards, we got to look at some of her pieces from Ralph Rucci, inside and out. Wtih Gail’s permission, I took a few photos to share with you, knowing you would love to see some of these details as much as I did. This silk dress had his signature back zipper set into the side panel instead of the center back seam. Here’s a detail of the front of this dress. 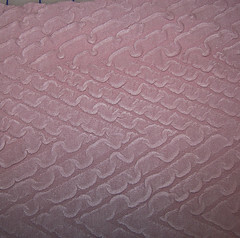 A spaghetti cording is whipped to the body with silk embroidery thread, the same detail as seen on the center back. Check out its lovely little peek-a-boo detail at the lower center back – just a little surprise – in an area where most women still can show a flash of skin and get away with it, no matter what your age. The display mannequins are covered in black leather, so the contrast doesn’t show up so much as it would if skin was showing thru the cut out. The fabric is a double face wool crepe – a truly wonderful soft but firm hand. That’s a fabric that I will have to look into. If you have seen any in your travels, let us know! The peek-a-boo detail was used on this jacket as well, on both the front and back. The contrast satin insets at the waist seam are a nice touch too. Sigh! Wouldn’t this jacket just be lovely over that sheath dress…?? Thanks to Gail for sharing some of her great work. I am looking forward to next year’s conference already.